Programming is a branch of computer science wherein you learn to write desktop, mobile or web apps. Most institutions and colleges teach students C, C++, Java, Python, PHP, and SQL. Frankly speaking, students spend 5 to 6 hours in the college and they get to spend just 2 to 3 hours in the college labs. College study isn’t enough if you want to have a successful programming career. To become a good programmer, you must learn and practice a programming language by yourself. First, start with the basics. Once you’ve mastered the basic concepts, you must proceed to advanced topics. Then, you must design and write programs on your own. If you’re on a vacation or if you don’t have a PC, you can learn to develop apps or websites on your mobile phone with the below free Android and IOS applications. SoloLearn is the most popular Android app to learn C++, Java, Python, SQL, CSS, HTML, C#, and many other languages. To get started with this app, you must log in with your FB or Google account. Once your account is ready, you’ll see a beautiful UI that flaunts a list of programming languages. Select a language you want to learn. Now, you’ll see a list of topics. Choose a topic from the list. At first, you must go through the 1st lesson. Once you complete this chapter, the app will display a series of question to test your knowledge. If you don’t score well in this test, go through the chapter once again. The next chapter will be unlocked if you complete the previous lesson. The app enables users to leave their comments on chapters. It rewards users with a certificate for completing the course. The app features a forum where you can discuss various issues with fellow users. It includes a code playground section where you’ll find several programming quizzes. This application allows users to compile and run the quiz codes. SoloLearn has launched several apps on the Google Play Store. The one that I’ve covered here is a great application for learning more than 1 programming languages. PH is a top-rated app for learning programming languages. According to its developer, you can master up to 18 languages with this application. When PH runs on the user’s Android phone, it prompts them to select their profession. It also makes them choose the reason for installing the app. Unlike SoloLearn, PH doesn’t asks users to log in to the app. Programming Hub displays a list of languages on its main interface. Users must select the languages they want to learn. 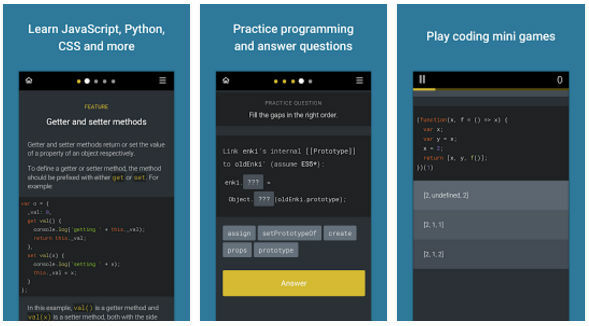 This app teaches you programming by displaying code snippets and their output. You cannot change the code and understand what the program does on execution unless you register an account with Programming Hub. You can access courses you’ve already taken in offline mode. Learn Programming is a different app than PH and SL. Like the above two apps, it doesn’t feature individual lessons. The app flaunts a list of functions, data types, keywords, and definitions in a list. At the top of the list, you’ll find a search box. You must select an item from the list or enter the term in the search box. When you do so, the app displays the definition and use of the keyword. LP features a sandbox section where you can test your programs online. 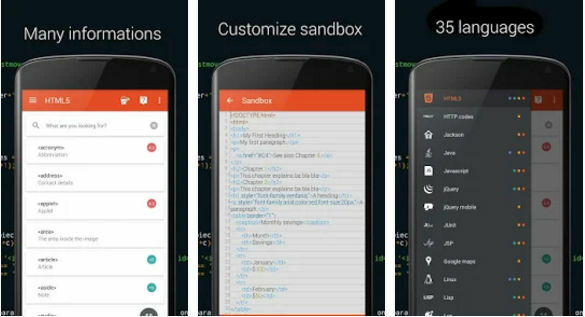 Users can customize the appearance of Sandbox editor. You can save your programs after providing LP the permission to save data to the storage memory of your phone. LP is an offline app. Unlike the above two apps, you don’t have to enable mobile data connection on your phone to use it. Learn Programming teaches you up to 30 languages. It has material design and inbuilt web browser for testing web apps. The Enki app groups lessons into four categories – beginner, familiar, confident, and expert. It enables you to cultivate self-learning habit by providing an option to set reminders. This app allows you to bookmark lessons. It features practice questions and has the option to leave a comment on the questions. If you can’t answer the question, you can share the question on social media and request your friend to answer it. Enki enables users to see their learning progress. It includes mini coding games too. 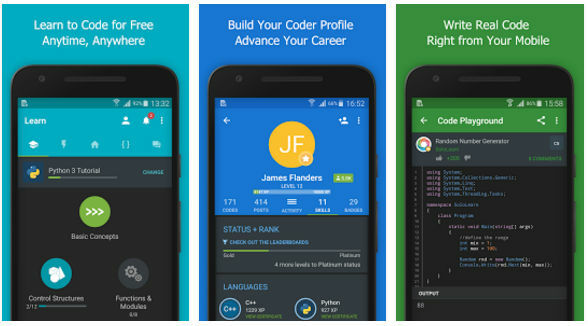 AIDE is a great app to test your Java and Android skills. 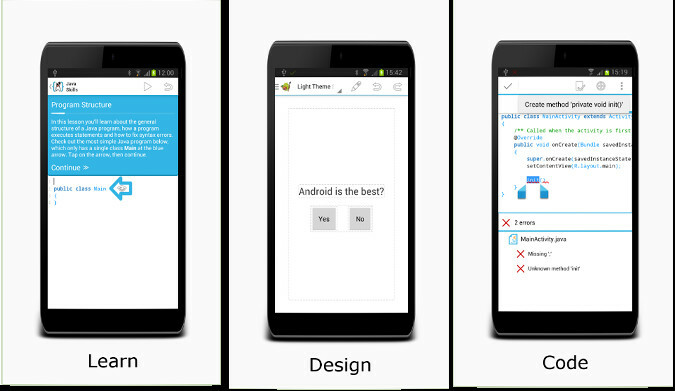 It features a mini editor that allows you to create projects and test or debug your code on the mobile phone. Apart from testing code, you can hone your programming skills by modifying the practice codes. AIDE allows users to see the warnings and errors thrown by their application. It can display code errors in real-time. AIDE supports code completion. It lets you jump to any line of the code and edit Android Studio/Eclipse projects on mobile phones. The app includes several interactive lessons. It has the option to save your work on Dropbox. 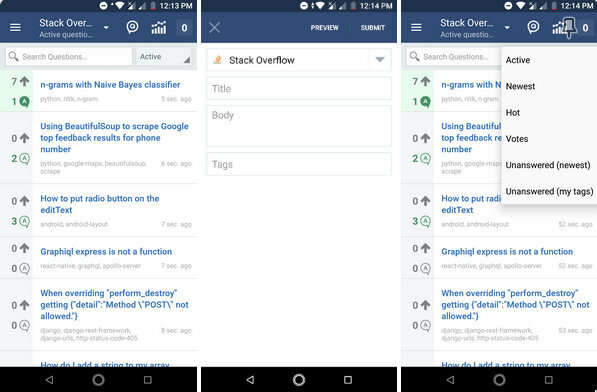 Stack Exchange is an app that gives you access to over 10 million programming related questions and their answers. The questions are published by newbies as well as seasoned programmers. SE allows you to post questions for free when you’re logged in. You can log in to this app with a FB, Google, OpenId account or register a new account by entering a password, username and email address. As Stack Exchange (and its sister sites) have a large number of active users, you can expect your question to be answered within an hour. When someone comments on your question or answers it, you’ll see a notification on your mobile device. To make sure, your question is not marked as duplicate or it doesn’t get downvoted by the community members, the users should use the search tool of Stack Exchange before posting their query. Programmers with good knowledge of C, C++, NET, PHP, Python, SQL can easily get a job in a reputed IT firm. They can also earn money online working from home by joining freelancing sites. If you want to learn a new programming language, download Enki, SoloLearn, Programming Hub, Stack Exchange, LP or AIDE. These apps are ideal for beginners and advanced users. Downloading the app isn’t enough. You must go through the lessons one by one.